Dictionary.com says teamwork is a "cooperative or coordinated effort on the part of a group of persons acting together as a team or in the interests of a common cause." That theme also resonates in a recent OCC document suggesting that, given the reality that all community banks face the same operational requirements, collaborating with other banks to meet some of them is one way to lower overall costs. The OCC indicates its support for banks to "pool or share resources to reduce costs and leverage specialized expertise". Particular areas where the OCC says it is open to such approaches include compliance, audit and appraisal reviews. The OCC reminds banks, however, that any collaboration effort must comply with antitrust laws and banks are responsible for ensuring they do not violate such laws. Some of our readers may not know this, but we certainly know a lot about the subject of collaboration and providing services to community financial institutions. PCBB was formed decades ago as a bankers' bank to do just that for and with our community bank customers and shareholders. We are a bankers' bank, which is a specialized bank (regulated by the state and Fed) that has been designed with one overriding purpose - help community financial institutions level the playing field against larger financial competitors. For decades we have done this by delivering products and services uniquely designed and aggregated for you. Since our shareholders are almost entirely community financial institutions, PCBB by design will never compete against you and this remains a key principle of our operations today. We are there to help you succeed in a variety of ways with customized products and services to give you an edge or solve a problem. We have helped hundreds of community financial institutions over the years because you formed us to do just that. Our mandate is to help you and your team compete more effectively, capture more customers, grow loans, improve profitability, meet regulatory requirements or just get advice on a multitude of industry subjects from our team of experts. Collaboration is all about working together, so we hope you are comforted in knowing our structure is specifically designed not only to remove any concern about competition, but also as the OCC points out above, to remove the risk of antitrust issues. Even better, as a regulated banking company, while our customers are specialized in that they are all community financial institutions, it also gives us great insight into the issues you face every day so that we can provide solutions to serve you. On many projects around your bank, as the OCC has pointed out, it can make sense to collaborate both internally and externally to reduce costs, increase opportunity and drive faster results. That said, it is also a process like any other, so understanding that and getting help when needed can also be beneficial along the way. As the industry continues to dramatically shift and you prepare for the litany of projects in front of you, we leave you with this thought we picked up from an Accountemps survey of executives. It found the single most important characteristic of being a team player was being pleasant to work with (at 31%). 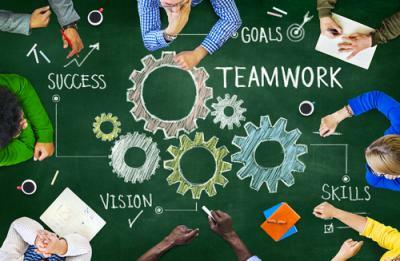 Know too that other research shows key steps for the most effective collaboration are: to all get on the same page; set clear expectations and goals; understand roles and responsibilities; be open; and have the dedication and desire to drive forward until the goal is achieved. Collaborative relationships are critical to an ever-stretched management team in this industry, so embrace the idea. Also, if you want to see how a non-competitor can help you hit your goals, be sure to give us a call or email. Yields rose 8bps as a result of the strong employment report for May which showed an increase of 280K. Yields are unchanged in what should be a quiet day for the market as there are no major economic releases scheduled. 1) First Harrison Bank ($471mm, IN) will acquire The Peoples Bank of Bullitt County ($239mm, KY) for $29.5mm in cash (50%) and stock (50%). German bank Deutsche Bank said it is conducting an internal probe into possible money laundering by Russian clients to the tune of $6B over a 4Y period. Zions Bancorp ($58B, UT) said it will launch a corporate restructuring designed to reduce expenses, increase revenues and improve performance metrics. Initiatives include: consolidating 7 bank charters into 1; consolidating risk functions; creating a new position of chief banking officer to cut costs and improve returns and other items. Sky News reports HSBC has followed JPMorgan in announcing job cuts. HSBC is reportedly preparing to cut 20,000 jobs, while JPMorgan previously announced plans to cut 5,000. CertusBank ($1.4B, SC) is preparing to liquidate itself after reaching agreements to sell deposits, loans and branches in various states, while closing branches in others. The company continues to pare back its operations after losing money over the last three years amidst legal conflicts with its various founders. The Financial Times notes demand for corporate bonds from US pension funds is projected to exceed supply over the next 5Ys, eventually reaching a $1T gap by 2019. The CFPB has fined RPM Mortgage $20mm ($1mm civil money penalty, $1mm to be paid by the CEO and $18mm to redress impacted consumers) related to allegations it violated the loan originator compensation law by paying higher bonuses for steering consumers into more expensive mortgages. Novantas research finds millennials now represent > 50% of the new checking accounts that are opened. Interestingly, 26% say they do so because of a life event (marriage, moving or having a baby) and 22% said it was because they didn't have an account and wanted to establish one.